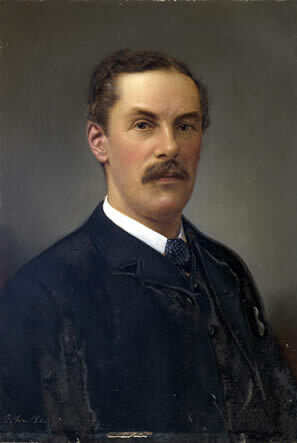 Alfred Henry Paget, architect, was from a leading Liberal Leicester family who were Unitarians at the Great Meeting. As an undergraduate at London’s University College, he won prizes in architectural examinations, was articled to the London architect Henry Darbishire, and gained practical experience with the progressive building firm of Cubitt & Co. In 1870 A.H. Paget was elected an ARIBA, and in 1873 joined the Goddard architectural practice in Leicester, bringing with him a wealth of professional experience and useful social contacts. Although a junior partner in the firm of Goddard & Paget, he was from the beginning actively involved in many of its major projects, and apparently superintended the building of the Granby Street Leicestershire Bank (1874) (later Midland Bank, then HSBC) from start to finish. Paget was a Councillor for Leicester’s East St Mary’s Ward, served on the Council’s Museum Committee, was a magistrate, and a long-serving Treasurer of the Lit and Phil and its President in 1887-88. He was also a founder member and Secretary of the Leicester Kyrle Society (est. 1881) whose aims were to ‘bring the influence of natural and artistic beauty within the reach of the poor’ by means of internal decoration, paintings, flowers, gardens, open spaces for recreation, concerts and entertainment. Paget was a well-read and cultivated man and a Shakespearean scholar. One of his papers was a fascinating attempt to ‘reconstruct’ Shakespeare’s theatre buildings from contemporary descriptions and stage instructions. As Clephan’s son-in-law he had sometimes attended early Club meetings as a visitor, and in 1882 ‘was elected into our small and rather exclusive brotherhood… henceforth the junior member of The Club.’ His firm designed his own spacious Arts and Crafts home on West Walk, where he lived with his wife, Jenny. It was described by Club members as ‘a good house, designed in the modern picturesque style.’ Jenny Paget (née Clephan) clearly sought education and intellectual stimulation too; for she was a member of the National Union of Women Workers, the Leicester Ladies’ Reading Society, and a regular visitor at Secular Society lectures. Source: Caroline Wessel, 2010. The Club. pp.85-96 in Exchanging Ideas Dispassionately and without Animosity (Leicester). See also Brandwood, Geoff & Cherry, Martin (1990) Men of Property: the Goddards and Six Generations of Architecture; Wright, C.N. (1892) Directory of Leicestershire. p.356; Aucott, S., 2008. Women of Courage, Vision and Talent: lives in Leicester 1780-1925. (Leicester), p.5.